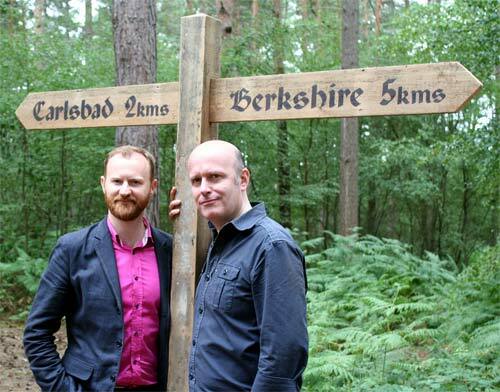 Mark Gatiss and Jonathan Rigby, on location for the BBC 4 documentary A History of Horror. Mark wrote the foreword for Studies in Terror. Photo by Matthew Thomas. We’re celebrating the publication of Studies in Terror: Landmarks of Horror Cinema with two launch events in London this October. On Friday 7 October Jonathan will be joined by author and critic Kim Newman at the Cinema Museum in Kennington for a discussion entitled ‘From Hammer to Chainsaw: Horror of the Sixties and Seventies’. This will be the first time that Studies in Terrorwill be available anywhere, and Jonathan will be signing copies during the evening. Tickets are available from the Cinema Museum. On Tuesday 11 October the Barbican Centre is the venue for a talk and Q&A hosted by Jonathan and Mark Gatiss, the actor and writer best known for Sherlock, Doctor Who and The League of Gentlemen Jonathan and Mark will be signing copies of Studies in Terror, and introducing a screening of the 1971 vampire film Daughters of Darkness (Les lèvres rouges). Tickets are available from the Barbican Centre.